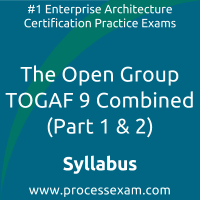 To achieve the professional designation of TOGAF 9 Combined Part 1 and Part 2 from the Open Group, candidates must clear the OG0-093 Exam with the minimum cut-off score. 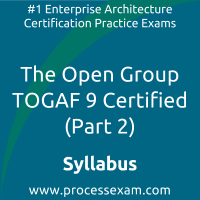 For those who wish to pass the Open Group OG0-093 certification exam with good percentage, please take a look at the following reference document detailing what should be included in Open Group TOGAF 9 Combined Exam preparation. The Open Group OG0-093 Exam Summary, Body of Knowledge (BOK), Sample Question Bank and Practice Exam provide the basis for the real The Open Group TOGAF 9 Combined - Level 1 and Level 2 exam. We have designed these resources to help you get ready to take TOGAF 9 Combined Part 1 and Part 2 (OG0-093) exam. 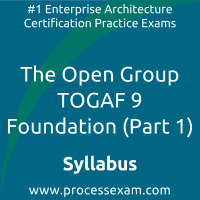 If you have made the decision to become a certified professional, we suggest you take authorized training and prepare with our online premium Open Group TOGAF 9 Combined Practice Exam to achieve the best result.